Main St. Portraits has been providing Kalamazoo and surrounding communities with quality portraits for over 12 years. Our goal is to surpass our client's expectations with both our friendly service and fine portraiture. 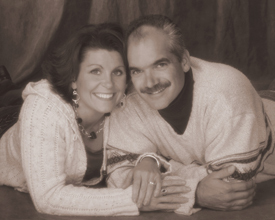 The history of Main St Portraits began in 1995 when owners, Alan and Nancy Gawel opened their first studio in Vicksburg MI. Six years later, they purchased a beautiful historical home in Portage that was perfect for a photography studio. With this new property they were able to create a beautiful outdoor area providing our clients with a variety of scenes and landscaped backgrounds, as well as a large studio equipped with a white room and enough space to build several unique sets. We now have two full time photographers, Alan Gawel (owner) and Vince Guarino (former owner and photographer of Guarino Studios of downtown Kalamazoo).